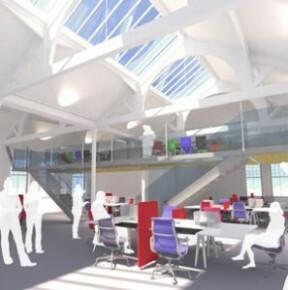 Located within the Govan Conservation Area and once described as Govan’s jewel in the crown, the prestigious Fairfield Offices will be available to lease from Spring 2013. The former drawing offices once used by engineers and draughtsman are being refurbished to accommodate a mezzanine level (right). The Fairfield Boardroom – a magnificent venue for hospitality and events – will also be available for hire.